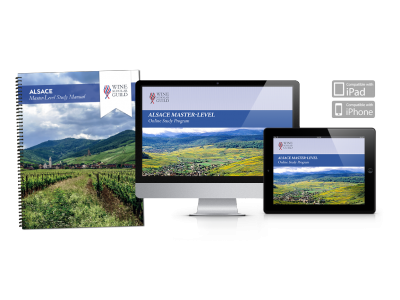 A comprehensive study and certificate program on the wines of Alsace. Online study materials are accessible for one full year from date of registration. I believe I gained info and perspective that will help me better describe and explain Alsace in my classes. I came away with a greater understanding of the Grand Cru and Lieux-Dits their location and their geology. I also understand that the AOC continues to evolve and that there are various interests with different agendas. Olivier Humbrecht\'s presentation on Quantity vs Quality grape growing and wine making was invaluable. Julien\'s pronunciation guide and the map exercises coupled with the text all helped to bring the area to life. The course has aroused a greater interest in visiting the region to build on the learning. Really happy I participated. The Alsace master class exceeded every expectation I had. Honestly, I was concerned that the material might not be worth the price and it took me six months to actually start the course but once I did I was hooked. The syllibus is very well thought out and quality of the professors/commenators was as high as possible. The professors embraced controversial subjects and provided a variety of viewpoints The curriculum allowed complexity to enter the discussion without being bogged down with irrelevant details. This course is not just good for building knowledge of Alsace but of wine in general.